A person is least of all himself when he talks as himself. Give him a mask and he will tell the truth. I stumbled upon mask making quite by accident. Early in my career, I was fascinated by the intersection of creativity and personal growth. (Still am, actually.) And since I had a background in theatre, I often fooled around with activities that drew from that world: dialogues, monologues, life scripts, the “stages” we play our lives upon, and especially, our inner characters. The power of those inner characters unexpectedly knocked me over years ago when I was teaching a class on creativity in counseling. It was the ideal place to try out new stuff, thanks to a game group of students who were all for experimentation. So one evening I asked them to draw the face of an inner character. They finished up by expanding the character through a writing activity – an inner stream of consciousness monologue. I am Anya, the artist. I sit staring out the window, watching the world pass me by. My paints and pencils are locked up. There’s no room for them in this life. There’s no room for me. With that, she started to cry. And clearly something profound had happened for her (and me) in that classroom. Only later, when I began to study depth psychology, did I begin to understand that this process brought life to deep, soulful, archetypal energies. That below the surface we each had a bounty of wisdom about what needed to be lived. Joys, sorrows, dreams, risks. And unbeknownst to me, I had found my way to a version of Carl Jung’s active imagination. As my interest grew, so did the activity, which expanded into a full-on form of mask making. 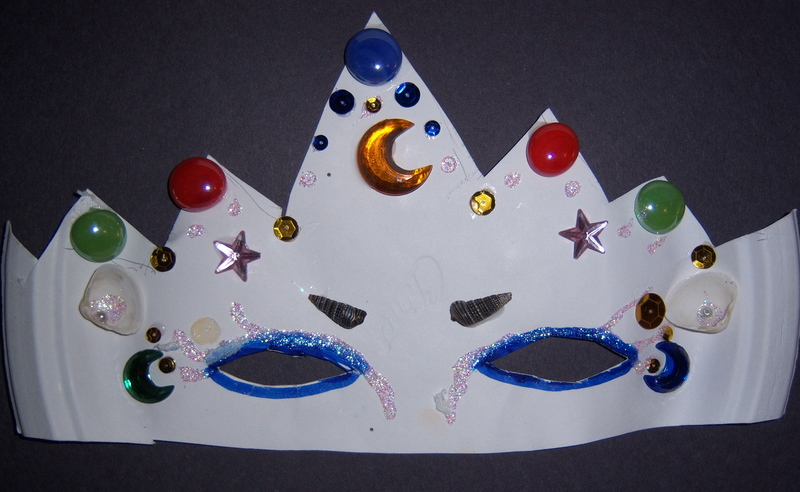 I remember workshops where rooms of people, tentative at first, took materials for their masks. As they eased into the rhythm of choosing, arranging, and gluing, their energy changed and it was apparent that this was a resonant experience of meaning making for them. As a result, I’ve gathered a merry little band of masks over the years, my own and others. For a time I had some on the wall in my office. And I absolutely loved it when people would walk in and say, “Oh, you work with children.” Nope! I couldn’t help but smile. It affirmed for me the innocent simplicity of mask making, the door opening to a colorful realm of imagination and insight. Later, when I moved to a bigger office across the hall, the masks came down. Stowed in a closet. Temporarily, I thought. I always meant to do something with them. You know how that is? And the truth is as much as I adore them, masks made of glue, glitter, yarn, ribbon, rocks, shells, moss, twigs, crepe paper, beads, and the like will begin to break down and eventually disintegrate. Thankfully, along came Meaning Mondays. What better time, I reasoned, to photograph them in all their fading beauty? Which, I am happy to say, I have done! I know, this is a repeat. But I thought you might like to see the hat from a different angle. Well, what do you think? Did you sleuth out mine? Leave your guess in the comments, and on Thursday I’ll spill the beans. And just in case you’d like to step into my world and create your own mask, I’ve pasted the instructions in below. Oh, and one final thing: What do you experience when you look at these masks? What do they say to you? Please share your thoughts in the comments. UPDATE: THANKS, EVERYBODY, FOR GUESSING. MY MASKS ARE #3 AND #5. SUZEN THOUGHT #5 WAS MINE. GOOD JOB, SUZEN. BUT DON’T FEEL BAD IF YOU DIDN’T GET IT RIGHT. ACTUALLY, SEVERAL OF YOU POINTED OUT THAT YOU WERE PICKING YOUR FAVORITE MASKS. THAT’S EXACTLY WHAT WE DO. ALL PERCEPTION IS PROJECTION, MEANING WE PROJECT OURSELVES ONTO PEOPLE, THINGS, ETC., AND PERCEIVE THROUGH THAT LENS. SO BY PICKING THESE MASKS, YOU ARE ACTUALLY HAVING AN EXPERIENCE OF YOURSELF! Please note: No particular artistic ability is needed for this activity! Masks can be powerful. They can open us up to the depths of meaning that lie within. Of course, there are different kinds of masks. You might be most familiar with masks of concealment, the kind children wear at Halloween. We adults wear masks of concealment too, the metaphorical kind, when we play roles that feel false and conceal our true nature. This activity, however, is about masks of enlightenment: masks that open a door to our deeper selves, that reveal rather than conceal, that create an exchange between our inner and outer lives. 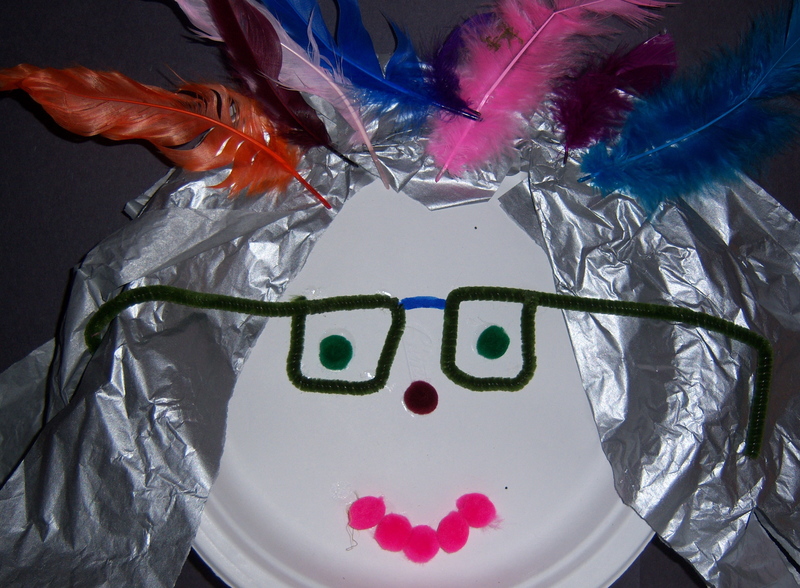 Masks that are playful and fun to make, but also lead to serious insights. So for this experience, you need materials to make a mask. You can use almost anything you have around the house or yard: string, ribbon, twigs, leaves, buttons, glitter, paper clips, stamps, dry beans, rice, tissue paper…you name it. But if you don’t want to use common household items, you can also go to a crafts store and buy an array of materials. 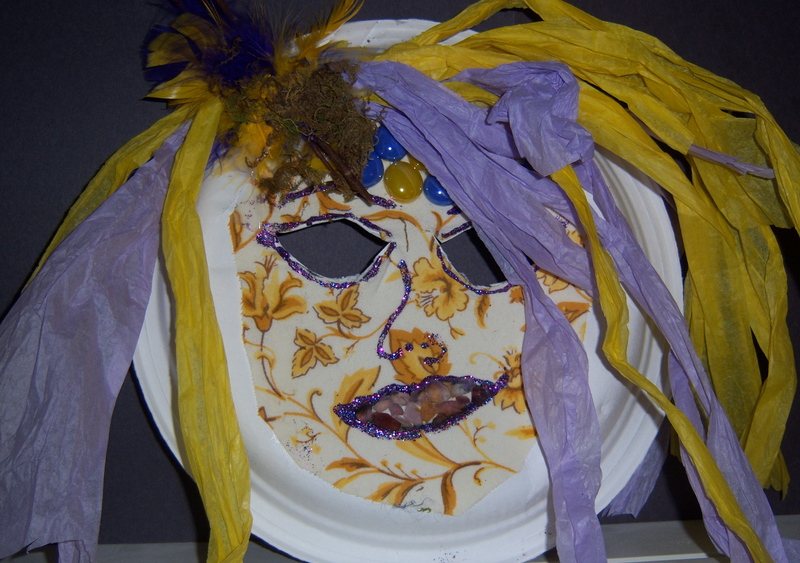 Whatever materials you choose, there are two things you will definitely need: a paper plate to form the facial structure of your mask, and glue/tape to attach your mask making materials to the paper plate. Remember a time or a moment in your life when you felt wonderful. When all was well. When you were at peace. When you were safe, strong, wise, and perfectly comfortable with yourself. This could be a peak experience or a simple, rich moment in life. Allow yourself to experience this memory deeply, and get an expansive sense of it. Use your sense memory to take you back in time. When you are fully in the experience, pay attention to the words that come up for you. What words convey the essence of this experience for you? Complete the sentences below with one or two words that embody your experience. When you are ready, start creating a mask that reflects this essential part of you. Let your materials guide you, and trust that whatever you create will be right. When you’ve finished, study your mask and get to know it. Does it have a name? Why is this aspect of you important right now? What messages does it have for you? FOR ANY OF YOU WHO DO THIS ACTIVITY, PLEASE MAKE SURE YOU SHOOT ME AN EMAIL AND LET ME KNOW HOW IT GOES! Hi Ryhen – Welcome! I really appreciate you stopping by. Ah, isn’t it nice to notice those synchronicities? And yes, I did do it unconsciously, but something deep was pulling me that I certainly didn’t understand then. I think Jung would find it be another synchronicity that soon after this I attended a workshop on depth psychology and discovered how and where all this stuff fit in. Thanks much for your comment. p.s. sometimes the masks that were showing up were the persona, but often they reflected an archetypal wisdom figure. Oh, Maryse, I’d love to read your thoughts on that Venetian mask. Isn’t Scarlet Pimpernel with Stewart Granger? I have a vague memory of it. So I’ll watch it again! Sounds like the perfect movie for right now. Thanks so much for your wonderful comments. I found number four to be quite fractured and disturbing. It made me wonder if the creator of that mask had awakened to its message. I was moved with the simplicity of these masks and their imperfection. You obviously are a great teacher who was able to get your points of purpose across for this exercise. Hi Tom – Welcome! So nice to have you visit my little corner of the web. Tom, I’m wondering what is it that particularly disturbs you about that mask? I know it’s a bit torn (not the fault of the mask maker). It’s the only mask of the bunch that was made by a man, an extremely deep, creative soul. One who sees life perhaps through a different lens than most of the world. So perhaps you were picking up on that. I love how you have picked up on the imperfection here. Thanks so much for your lovely comments. Very cool. I like Meaning Mondays. The masks are great. I like the one with the hat, that’s my guess for your mask. When we go to Epcot, we’ll visit one of the countries around the world, and let my daughter make a mask. Each country has a different mask, and the kids can color them with crayons or markers. Maybe next time we go, I’ll pick one up for myself. Hi Eric – Welcome back! I’ve been missing you. That sounds so fun at Epcot. Why not do one yourself? I think you will find it a memorable experience. These are so great! 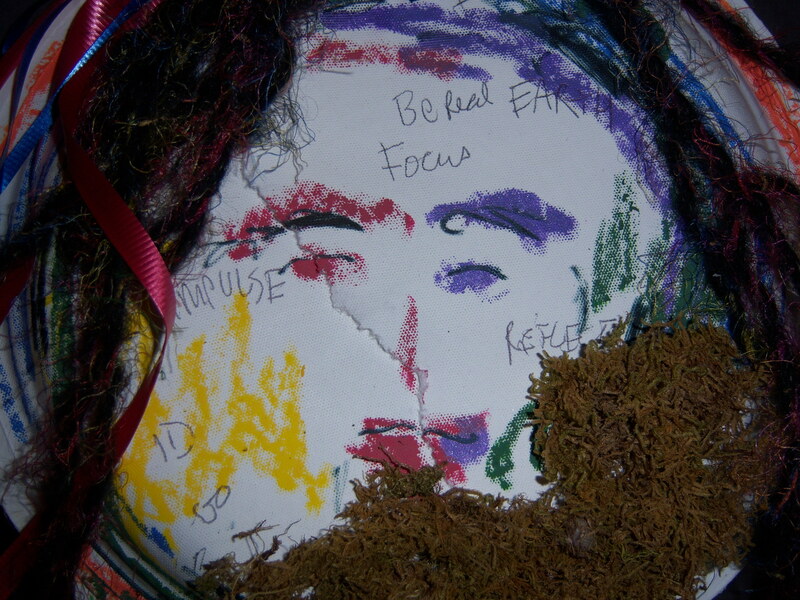 I’ve done a lot of experiential therapy and art therapy. It’s an amazing process to be a part of and oh what comes up is profound insight and growth. Hi Tess! Yes, isn’t the insight and growth that comes from it unbelievable? I know people tend to think of it as more of a healing, therapeutic intervention, but I also absolutely love its power in coaching too. Time to break it out and use it everywhere. Cool idea for people to get together and do a self directed group. Thanks for your wonderful comments. Goose bumps/truth bumps: all good! 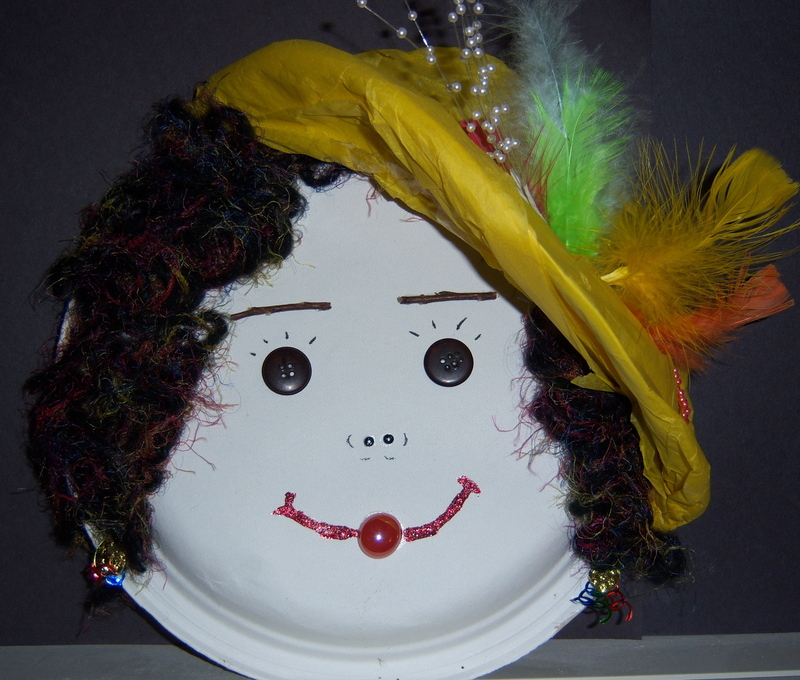 My guess is #2 with the fancy hat and the happy smile is by you. Thanks, Belinda. I think you’d like mask making. It’s not so much related to what it says about you, but more what it says to you. Usual deep insights and ah has! I have looked and looked at these masks. 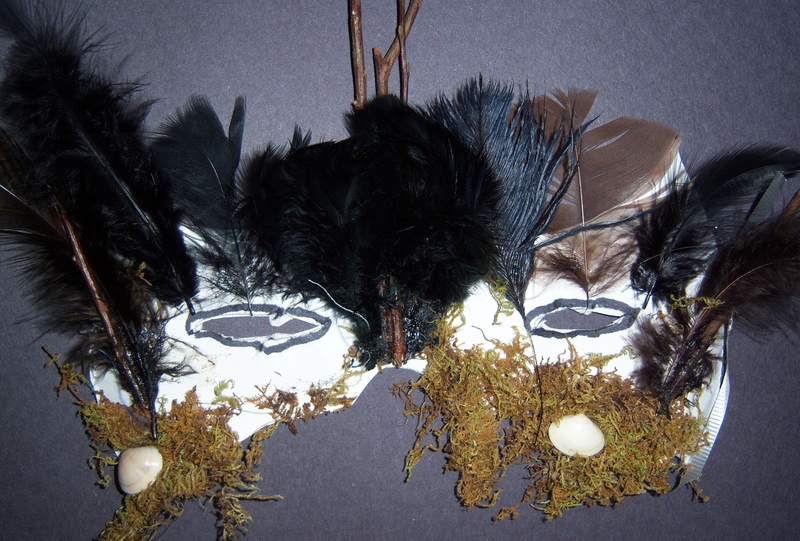 I have made masks and made other things but I cannot figure out which one is you! Thanks for looking, Nicki. I’ll let you know in a few days! Hi Patty! Mask making is such fun! 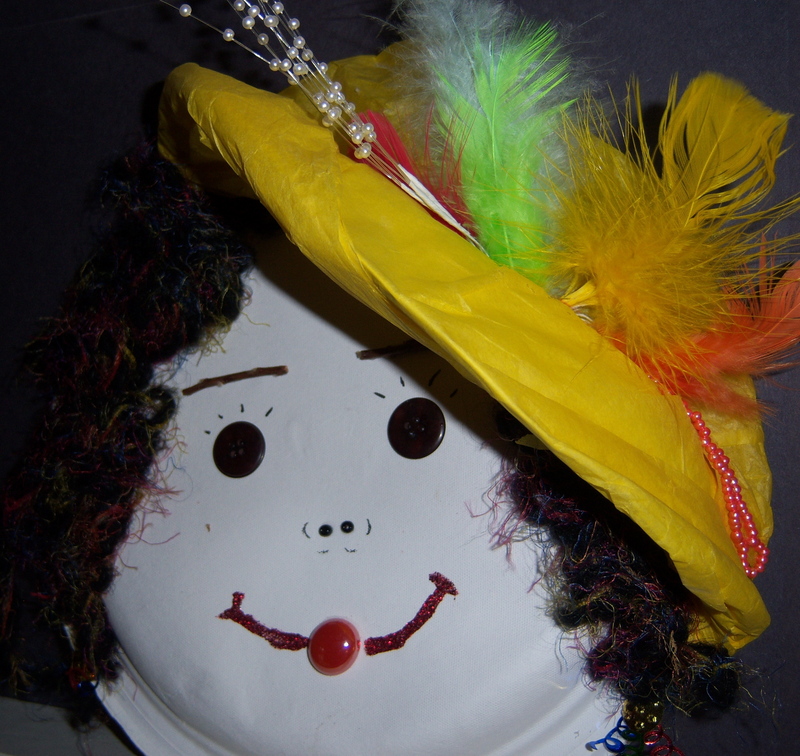 I only have one that I made in a clay class – I named her – did you name yours? I name everything, my house plants (which I talk to) my car, just about everything really! I feel a “vibe” with 3 and 6 in your photos. Hi SuZen – Yes naming is so important. I did name mine. I will tell you more in a few days. Love that you name everything. Just curious, what is you car’s name by the way??? I have a funny feeling yours is number 2. I have looked at it a few times and…..
number 2 i felt simple, easy going, approachable, a bit timid, caring, warm, shy…. number 4 deluded, confused, unhappy seeking for true friendship…. well patty thats the end of the mask game for me lol!!!! p.s. dont take me too serious on it lol!! Wow, Ayo, you really put your heart into this! I love it. And I think you picked up on some of the archetypal energies in these masks, including shadow stuff. Thanks! Patty — This was a very interesting post. It made me think my anthropology studies when I was in college. Yes, I once wanted to an anthropology major:~) Anyway, masks have been so much a part of history that they are fascinating!! I loved how you used masks to help people bring light to the hidden corners of their lives. 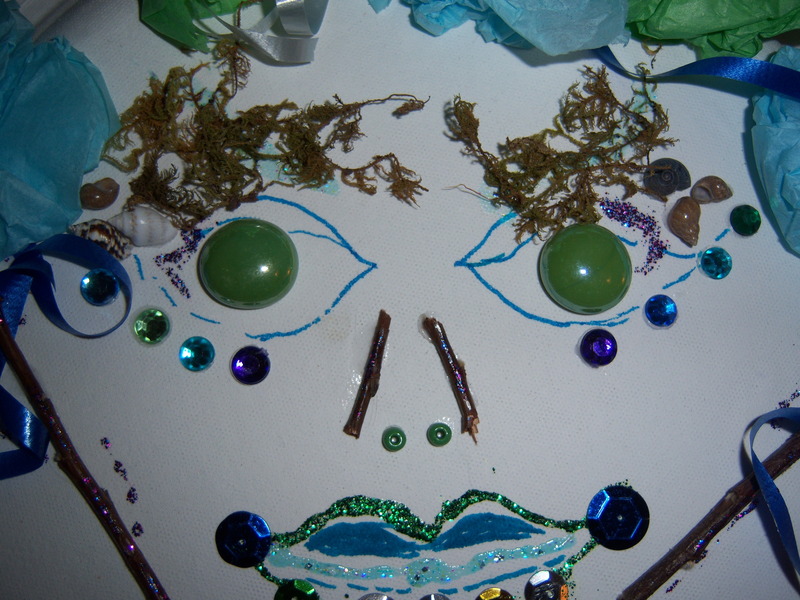 I also appreciated your tips for making a mask…I’ll have to try this! Hi Sara – Thanks for the visit! You must love history and culture if you were once an anthro major. And I like how you notice that you are picking your favorite masks. Because that’s what we do…we project ourselves when we perceive. Very wise! Pingback: Meaning Mondays: The Singing Blog Edition « Why Not Start Now? Pingback: Isadora Duncan. Wannabe Syndrome. And Scarves. | Why Not Start Now?